It’s made entirely from scraps of yarn left over from other projects, apart from the brim which is yarn from a frogged cardigan; and it’s reversible. Observe and interact: I observed that I had been collecting yarn scraps for the past few years and decided to make creative use of those long enough to tie together. In addition, observation of the hat as I made it allowed me to create the shape without following a pattern. Catch and store energy: Wearing a hat is a good way to stop heat (energy) loss and with its tufts, this hat provides good insulation by trapping a nice layer of insulating air. In addition, the energy embodied in this scrap yarn is being captured because it’s being used rather than discarded. Obtain a yield: A hat where none existed before, plus the satisfaction of creating something from (almost) nothing. Apply self-regulation and accept feedback: As with anything made without a pattern, this hat ‘evolved’ as I made it – I increased the number of stitches until it seemed to be the right size and decreased to get a nice snug brim. Whatever yarn you are working with, you have to respond to its characteristics. Use and value renewable resources and services: As long as there are people using yarn, there will be left-over scraps; this provides a way to convert them into a useful and unique object. Produce no waste: It’s all too easy to throw away left-over yarn, but this demonstrates that it can be put to good use. There were lots of scraps that were too small to tie together for this project, but those will be used in the future for stuffing. No Yarn was wasted in this hat, because the ends that in other projects get trimmed off have been retained as a feature of the hat. Design from patterns to details: The overall plan (pattern) was to create a hat with yarn scraps. The details came as I tied the pieces together – varying the colours and lengths to create a unique pattern. The plan also involved making the hat reversible, so different details appear according to the side that is exposed to the world. Integrate rather than segregate: It’s a whole mish-mash… integrating colours, textures, fibres. Use small and slow solutions: I’ve been collecting the scraps for several years, so I won’t be able to make another with this gauge of yarn for some time yet, although I’m planning a chunky version because I probably have enough thick scraps to do that. Despite using ‘waste’ yarn, it took a longer time to make than a ‘normal’ hat because so many pieces of yarn had to be tied together. Use and value diversity: I have rarely seen a more diverse hat! Use edges and value the marginal: The end of each piece of yarn is an important feature of the hat – providing decoration and insulation. I think it may also be pretty ‘edgy’ as far as fashion goes!! Creatively use and respond to change: The changes in colour and texture were used to create the ‘look’ of this hat… there will never be another one like it. So, there you have it, a quick lesson in permaculture and a rather mad hat… It will be for sale at the IPC in September unless I get a better offer before then! NEWSFLASH: IT HAS BEEN SOLD! 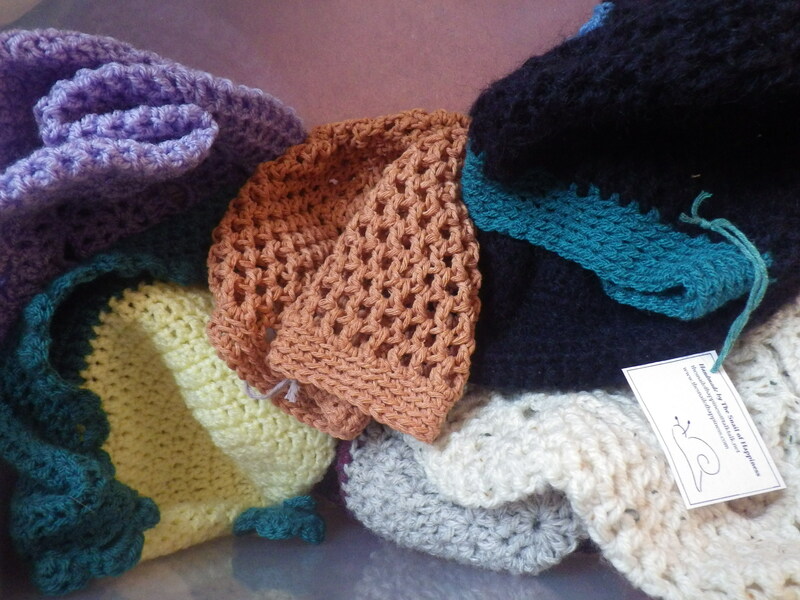 SORTING OUT MORE SCRAPS FOR MORE HATS NOW. Peppers and chillies and limes – oh my! About 6 or 7 years ago, I met David Holmgren at a permaculture day he was holding at his farm Meliodora, in Victoria. Having met the man, I think he’d approve the hat. I go so far as to say I think he’d wear it! Well, that’s good to hear! I really think that what you have achieved in creating something which so perfectly aligns with the principles of permaculture is quite brilliant! That hat is darn cute. I would wear it on either side. That is a great idea, Marlene! I love your hat, and this is the first time I’ve come across the 12 principles of permaculture — so interesting! I’m going to save these to think on. Thank you! Glad you found them interesting. I like to think through what I’m doing on the basis of these principles every now and then. Fantastically scraptastic! Now I know that permaculture principles can inform all parts of our lives and not just gardens and agriculture! No weaving – the ends are staying as a feature – it’s reversible so can be worn ‘smooth’ or ‘shaggy’! Love the hat and the 12 principles… I shall apply them to my own creative outpourings. I’d not come across them before, but I shall head off to explore the world of David Holmgren. I like the 12 principles… useful to think about in all sorts of contexts. Thanks for sharing the permaculture principles. I don’t think I was fully aware of them in that detail. You’ve applied the principles to this hat beautifully. What a joyous post.